Home › Latest News › ​Being Winter-Savvy in Cape Town! ​Being Winter-Savvy in Cape Town! 1. Safety first! Check your tyres. With rain lifting oil off the roads and making road markings twice as slippery, a very important factor for keeping rubber to tar is to ensure that your tyres are in good condition. You need all the traction that you can get, so if you’re not sure, bring your bike past our workshop for our team of Harley® technicians to have a look at. 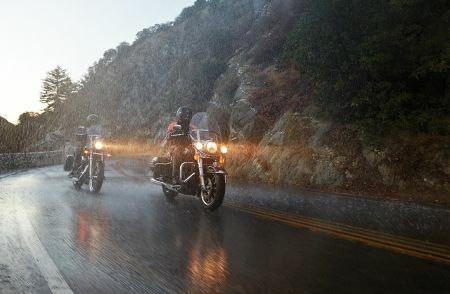 Even if there is only a mild drizzle, this is greatly amplified when riding your motorcycle. You’ll get soaked! A great investment for winter, is a rain suit. You can easily slip this over your riding gear and avoid having to wear damp clothes all day. The rain suit also helps with wind protection. Most Harley® models are compatible with various saddle bags/ panniers within their range. As most backpacks are only slightly water-resistant, placing your luggage into saddle bags/ panniers is a great way to keep your belongings dry – especially on long trips! Ride safe, see you at the dealership soon!